Posted on Tuesday, March 5th, 2013 at 8:26 pm. Adapted from Radically Simple by Rozanne Gold. This recipe has it all. It’s flavorful, satisfying, healthy, and boasts a combination of flavors that will get your culinary creative juices flowing. The best part? It’s ready in less than 30 minutes, so you’ll have it on the table before you have time to think about takeout. * Dukkah is a traditional Egyptian blend of spices, nuts and seeds. We Olive’s Dukkah is made with cumin, coriander, sesame, macadamia, pistachio and almond. Dukkah is available online or at any We Olive store. Preheat the grill (although your broiler or a grill pan will also do). Pound each chicken thigh slightly with a mallet so it grills evenly. (I like to place a layer of plastic wrap on my counter, lay the thighs on top, and then cover with one more layer of plastic wrap. This contains any flying bits and makes for easy cleanup). Place the chicken in a large baking dish and toss with the olive oil to coat. Season with salt and then sprinkle liberally with the Dukkah. Meanwhile, bring the broth or water to boil. When boiling, add cardamom and a bit of salt before stirring in quinoa. Reduce heat to simmer, cover and cook for 15 minutes or until liquid is absorbed and quinoa is tender. Place the chicken thighs on the grill, cooking for about 4 minutes on each side until cooked through. Remove from heat. Put the tomatoes in a food processor with the brown sugar, garlic, ginger, jalapeno and cumin. Pulse until coarsely chopped. Season with salt to taste. When the quinoa is cooked, remove from heat and stir in the golden raisins and garbanzos. 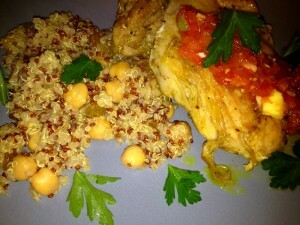 Serve the chicken over the quinoa and top with the tomato chutney.